Slat Fencing is an innovative, modern form of fencing that offers the latest in architectural style. Slat fencing can be made from timber or aluminium, and can used as boundary fencing, garden feature, privacy screen, louver or sunshade. Whilst timber requires ongoing maintenance, aluminium slats are made from high strength, long lasting aluminium blades which can be adapted to a number of applications, are low maintenance and available in a timber look or powder coated finish. 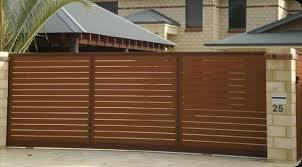 Contact Michael 0418 204 429 and he will be able to give you a free quote for all your horizontal slat fencing needs.